We're starting off 2013 Summer NAMM with a celebration in the show's new home at Nashville's Music City Center! 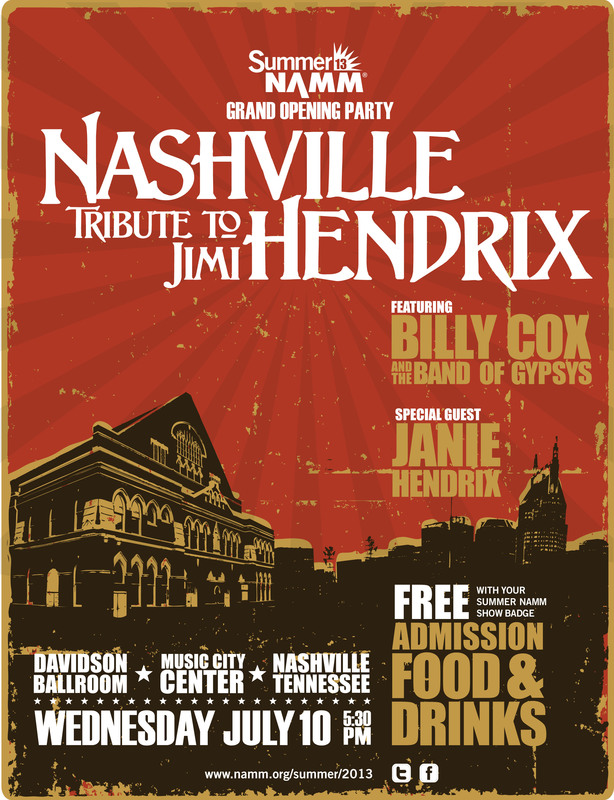 Join us Wednesday, July 10, for the Grand Opening Party featuring a "Nashville Tribute to Jimi Hendrix" with the Billy Cox Band of Gypsys Experience and guests, as well as a special appearance by Janie Hendrix. This event will give you an insider’s look at Jimi Hendrix’s Nashville connection from his Army buddy and longtime bassist, Billy Cox, who will perform with his group, The Band of Gypsys Experience. The show will weave stories of Jimi’s days in Music City with live performances of some of his famous and not-so-famous songs. The fun starts at 5:30 p.m. in the Davidson Ballroom and runs until 7:30 p.m., so you can head out on the town afterward. NAMM Members will enjoy free food and beverages (first come, first served). Don't miss this one-of-a-kind experience!